You are in the write place! Thanks for coming to BigDrumNation, the Grenadian Journal of Arts and Culture. On January 10th, 2013, it was announced to the Grenadian public that Prime Minister Tillman Thomas had advised the Governor General of the need to dissolve Parliament ultimately calling for an election date to be set within the following 90 days. Grenadians knew that an election was impending but the decision to dissolve Parliament had made the moment more real and urgent. It bears pointing out that the Short Knee processioneering betrays aspects of the “social geometry” that professor Robert Farris Thompson, a leading scholar of African art, observed among the Ba-Kongo and Yoruba peoples of Africa. A key feature of this social geometry is what Thompson calls “circularity”- the practice whereby masqueraders engage in circular perambulations as they approach a village, town or crossroads: It is believed that circularity brings peace and healing, and exerts a form of cooling. It should be some interest to Grenadians, the fact that the Yoruba verb to parade, yide, is derived from yi, meaning to roll. 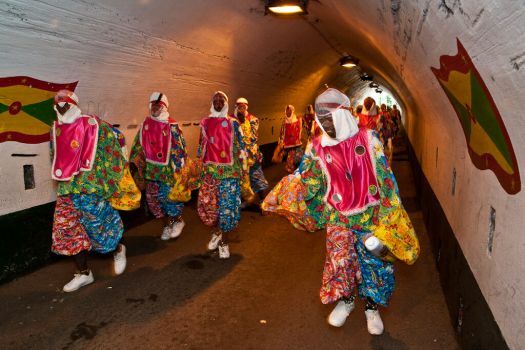 In Grenada, it is common to speak of masqueraders as “rolling” into this or that place. I grew up with carnival and have always been close to the "Art Form" and my Grenadian "culture." But please don't ask me for a precise meaning of the preceding assertion. Okay, with some prodding I will say that I am a “strong supporter of carnival”; I will also allow that the years have diminished some of my boyhood excitement over the mas’. Today, so many years past boyhood, carnival has evolved to a place where it bears no resemblance to the festival that the likkle boy once lived for: and neither is the man pining for the carnivals past. “There are nonmaterial forces which cannot be measured precisely, but which nonetheless carry weight”. We can see in the Carnival the possibility (we do not go any further than possibility) of such a national mobilisation, as would put to shame all efforts that have hitherto been made in industrial and social activity. Carnival is the rule of the subconscious. A time when, among things, we don masks to portray our inner lives- our fears, our desires, our defects: Carnival is both confession and confessional; it is rebellion and submission. The first documented mention of the word carnevale is 1092 during the Dogate of Vitale Falier of the Venetian Empire. The most likely etymology of the word carnevale may be derived from the Latin carne + vale meaning ‘farewell to meat’. Carnevale was associated with festivities in the Republic of Venice in the days preceding Lent. During Lent Roman Catholics were expected to “stay away” from meat and dairy products and use the forty days for reflection and fasting. It meant that naturally the days preceding the beginning of Lent (Ash Wednesday) would be full of festivities culminating on Shrove or “Fat” Tuesday. The Italian carnivals become very famous and even spread to other Europeans Countries.